At first glance, the folks at Azar's don't seem to mess around with secret ingredients. When you order the sumac chicken pita sandwich, that's what you get — strips of grilled chicken smothered in onions and sumac. Kyle Parker steps out of the kitchen, shows off a dish of sparkling, lavender sumac granules, and explains how the deep-toned spice imparts pink tones to the grilled chicken. That's his favorite part about cooking the dish — watching it change hue. As the meat turns pink, the spice turns black and mingles with grilled onions. The result is one of the best chicken sandwiches in the region — and the only sumac-themed one. Mellow and fragrant, smoky yet piquant, sumac is a lip-smacking Greek spice that waitress LaDonna Winters describes as "tart [but] when the onion is grilled with it, it has a bit of sweetness." While many customers don't try the sandwich (because they aren't familiar with sumac, and naturally, people fear the unfamiliar), many customers are familiar with Azar's lentil soup. One spoonful and a spice lover will swear it contains cardamom, but one more and there's a subtle hint of cinnamon, or cloves. Then there's garlic, maybe. Guessing is futile. Katy Azar won't share the contents of her lentil soup spice mix. Unlike their celebrity counterparts who have been known to blanket the Internet with easily replicable recipes (ahem, Emeril Lagasse), Spokane's local chefs of global origin keep their tradition-bound, age-old secrets confidential. And while many chefs rest on the laurels of American plenty, substituting regional options — of which there are many — for hard-to-find ingredients, the authentic tastes of a culture lie in what cannot be faked. You cannot fake spice. And for adventurous diners — or diners deciding to indulge in a night of adventure — searching out hard-to-find ethnic dishes is a different sort of route to indulgence. 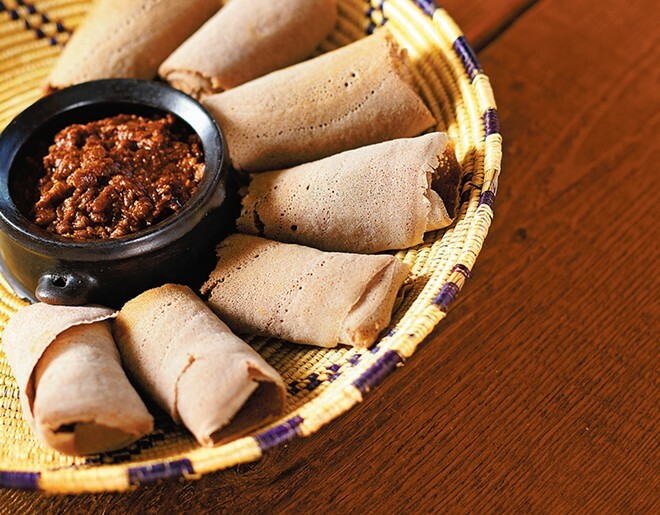 Almaz Ainuu, owner and chef of Queen of Sheba Ethiopian restaurant in the Flour Mill, explains that berbere (a traditional, pungent North African seasoning) is a mixture of 20 different spices, but she hedged a bit when asked what the spices were. There's turmeric, but that was the only specific. She did mention that the spices aren't simply combined — they're ground together so that each spice is deeply infused with the qualities of every other spice in the mixture. The spice is mixed with clarified butter, and meat is slow-cooked in it until tender. The result is complex. The flavors found in the yeme shir kikwat (split red lentils in berbere sauce) and tibs we't (beef strips in berbere sauce) cast a long, ever-changing glow. Each bite brings on a subtle shift from tart to slightly sweet to a savory intensity that fades and lingers, urging you toward another bite. But not all spices come from hot climes. At the Alpine Delicatessen on E. Third Avenue, you'll find one of the few native, hot spices Europe has to offer: horseradish. While the Alpine dresses sandwiches with their own in-house prepared horseradish, no one could tell me exactly how the horseradish was prepared. Stonewalled, I moved on. Most people know that throwing some bacon into a pile of mayonnaised potatoes does not a German potato salad make. However, vinegar alone cannot be responsible for the signature sour snap and smooth finish of the Alpine's authentic German potato salad. There must be some oil in there and some dill, definitely onion, but what is in that creamy, white, vinegary dressing that drizzles and drapes chunks of boiled potatoes?